It doesn’t matter if you hire the best photographer or videographer; if you wear the wrong type of makeup, your photos will look far from perfect. Unless you are a celebrity or a celebrity makeup artist, you wouldn’t know to apply camera-ready makeup. Otherwise, for the rest of us, know that certain makeup isn’t camera friendly. For foundation or powder, use non-SPF products. Foundation or powder with sunblock will look whitish on camera. The camera will pick up on spots of demarcation. So only use makeup with no sunblock. For shine or shimmer on the cheekbones, use these particular products sparingly. Camera flashes will emphasize shine and pick up on unevenness. For eyeshadows steer away from glitter and shimmer. For camera ready eyelids, use matte eyeshadows, and for lipstick/lip gloss choose matte colors as well. It is common for a bride to get a fresh tan a number of days before the wedding. You may look like a million dollars, but keep in mind you can still stain your beautiful wedding dress even if you have had many showers in-between. The Honest Company stain remover is great at treating stains on clothes that are washer friendly. Always run a fabric test before applying stain remover to your dress. 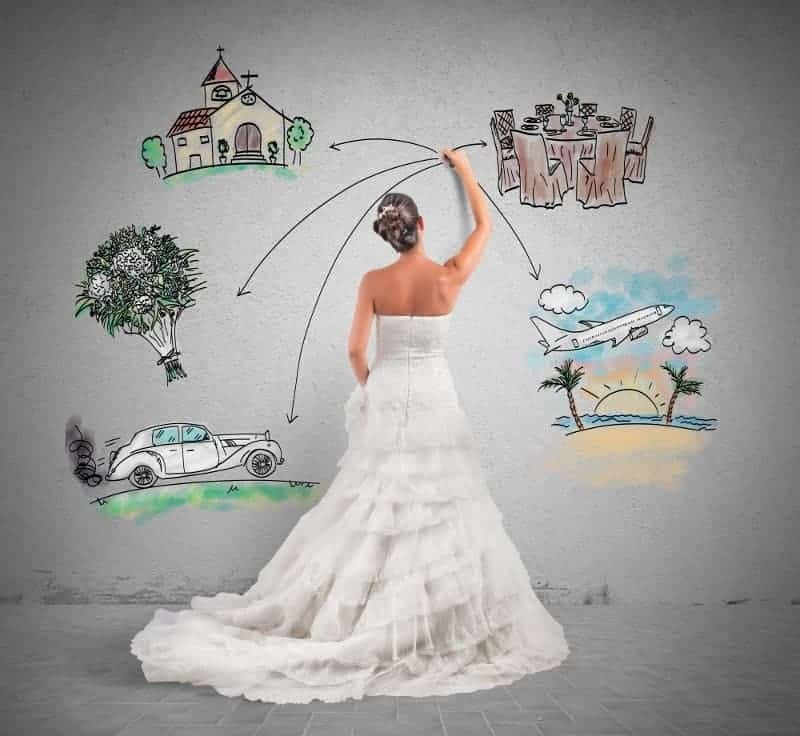 Whether you hire the best wedding planner or you plan on taking the role yourself, mishaps, mistakes, and emergencies are bound to happen, even if you’ve planned for perfection. When it comes to you, the bride, you must be flawless and stress-free. This Wedding Day Emergency Kit comes with over 30 different items for a fashion, cosmetic, or minor medicinal emergencies. Inside this kit are items from a sewing kit to tampons to Tylenol and everything in-between. This is the most important day of your life. You will be on your feet all day, and you will need the right comfortable shoes. Think about it: You will be on your feet from morning until the wee hours. From preparing, packing last minute things, getting ready (hair, makeup, and attire), and walking down the isle to greet your guests at the reception to then dancing the night away, all on your feet, you will need the right shoes. So why not prepare effectively and wear appropriate heels for the occasion? High Performance High Heels will help you stay on your feet longer than traditional 4 inch heels, because they not only have the padding in the right places (arch, ball of the foot, and cupped heel support) but also have superior shock absorption, gravity defying, and fatigue resistant properties to help you stay on your feet longer. This is Vanessa. These heels are handcrafted in Italy by some of the most talented shoemakers in the world. The Vanessa is a romantic wedding shoe. Both brides and bridesmaids love these shoes and often all wear them as a single party! Its satin lace-up adorns the legs while the construction of the shoes keep the feet in place and secure and the external platform gives that extra height without the extra pain. Two things make this shoe very comfortable even for longer hours: its shoe construction and its special orthopedic insole technology. Vanessa comes in cream color and with baby calf leather- the finest Italian leather. It’s sister, Blue Louise (blue), is a great recommendation for bridesmaids as well. Most brides think it will be a trip to the park going to the restroom in their gowns. The reality is most brides need extra help with lifting up their heavy gowns when going to the ladies room to empty their bladders. Often, bridesmaids have to help the brides keep their dresses up and off the floor and surrounding toilet areas- all so that the dresses don’t get in the way or get dirty and the brides can actually go potty. But you can avoid this potential messy headache with Bridal Buddy. Bridal Buddy fits seamlessly under your gown. When you are ready for the potty, you can gather your gown together in its own “pull the string” method, so you can go to the toilet on your own- mess and struggle free. Bridal Buddy comes in two length sizes. If you know of anyone getting married, please share this post with the Bride!